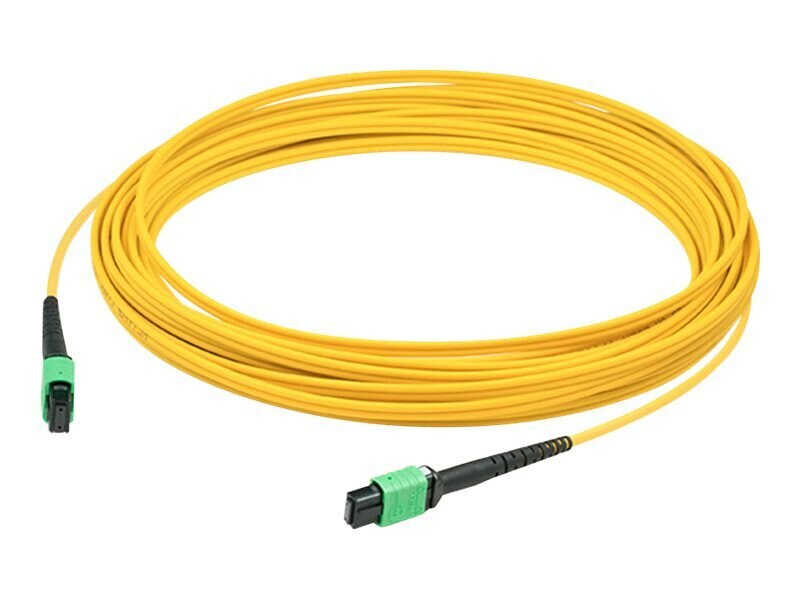 This is a 3m single-mode fiber (SMF) female to female MPO/MPO OS1 straight yellow patch cable. Straight-through cables are typically used for interconnection of patch panels, and are commonly referred to as key up/key down or key down/key down configuration. This high-density 9/125 cable accommodates 12 fibers (6 duplex circuits), providing savings in circuit card and rack space. In addition, it accommodates speeds up to 40 gigabits, commonly used in QSFP+ applications. This patch cable is recommended for connections between fiber patch panels, hubs, switches, media converters and routers, etc. They provide higher speeds and increased bandwidth compared to conventional twisted-pair copper cable. Each cable is 100% optically tested for insertion loss before you take ownership. Our patch cables are 100% compliant for all of your networking needs. Our products are guaranteed by federal law to not affect or void OEM warranties.